Atmospheric chemistry during the day and night transforms NOx into a suite of inorganic and organic compounds that govern the global distribution of NOx, bio-available nitrogen and acid deposition patterns, and halogen activation. We are interested in developing a quantitative mechanistic understanding of these transformations and effects. Our interests in daytime NOx chemistry has recently focused on understanding transformations in forested ecosystems where biogenic emissions of reactive hydrocarbons present ongoing challenges to our understanding of both oxidative processes and the partitioning and exchange of reactive nitrogen. 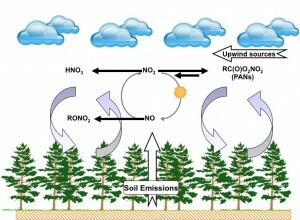 In particular, we measure ecosystem fluxes of acyl peroxy nitrates (PANs) and have developed a 1D vertically resolved model of forest-atmosphere exchange where the emphasis was to understand the extent to which vertical gradients in the chemistry perturbed the deposition (or emission) fluxes of reactive nitrogen. Click here to download a copy of our Matlab based code that automatically generates a chemical solver using the Master Chemical Mechanism. The goal of the measurements and modeling in this regard is to better understand the dry exchange process of atmospheric fixed nitrogen which includes NOx, PANs (RC(O)O2NO2), alkyl nitrates (RONO2), and nitric acid (HNO3). Atmospheric fixed nitrogen, largely of anthropogenic origin, may represent an important nutrient source for continental ecosystems and thus affect productivity and carbon sequestration. Click here to download the Matlab code for the Canopy of Atmosphere Forest Exchange (CAFE) model described in Wolfe and Thornton, ACP 2011. Even though dry deposition is thought to represent ~50% of atmospheric nitrogen input to ecosystems, direct flux observations of individual reactive nitrogen components are very rare. Our work on this project has been funded by NSF-ATM, and graduate fellowships from NASA and EPA STAR. Nighttime reactive nitrogen chemistry remains poorly understood, but is thought to regulate 30-50% of NOx transformations and removal on a global average basis. Observations and mechanistic understanding are lacking, thereby preventing crucial tests of predictions based on current theories. We have developed and continue to use novel techniques for in situ observations of key intermediates and end product concentrations (e.g. N2O5 and ClNO2) and the instantaneous rates of the reactions that connect them. We also continue to perform fundamental laboratory process studies to develop deeper mechanistic insights. Our work in this area has been funded by NASA NIP, and recently an NSF CAREER award as well as a graduate fellowship from NASA.